However with such a breadth of things going on around the country, it can sometimes get a little overwhelming to separate the champs from the chumps. You’re busy people, we get it. To help you out, we have collated a guide of the best-goings-on for the month of November, helping you plan your calendar accordingly. Thank us later. The Chinese New Year will be celebrated in style this year, with the Lunar Lanterns exhibition being stationed between the Sydney Opera House, Circular Quay and the Rocks. Follow the 13 larger-than-life lantern animals (signs of the Chinese zodiac) and wind up in the Rocks Lunar Markets for a feast. With the Sydney Harbour Bridge lit up red, the Darling Harbour dragon boat races and a ‘zodiac roulette’ all in the vicinity, the Lunar New Year leaves you with plenty to explore. Hosted at the Royal Botanic Garden, this year’s Tomato Festival is celebrating the magic of seeds! Boasting a tomato taste test, a ‘longest’ lunch, cooking workshops and plenty of tomato-inspired food, drinks, sauces and condiments. If you are a fan of the humble red fruit, head to the Botanic Gardens for this festival, and if you are a tomato connoisseur take it a step further by entering one of the many tomato competitions to really get involved. Every Saturday in February, Southern Highlands. Head to the Southern Highlands to immerse yourself in the hops harvest this February. Southern Highlands Brewing welcomes visitors to Sutton Farm to harvest hops in the field and then reward themselves with a craft beer. These tours, run through Wild Food Adventures, are ideal for the beer and food lover, with a beer-matched lunch at The Taphouse included in the tour. Hosted at an open-air amphitheatre in Rozelle’s Callan Park, Laneway festival champions indie music and, this year in particular, women in music. With a solid line up of indie rock, pop and R&B/hip-hop, Laneway 2019 boasts names like our very own Gang of Youths and Courtney Barnett. Running from the Friday the 1st till Sunday the 24th of February, the Roaring 20s and all that Jazz festival is an opportunity to step into your best evening gown and whip out the suspenders. Hosted at venues across the region including the historic Carrington hotel in Katoomba and Hydro Majestic Hotel in Medlow Bath, the festival will be filled with live jazz performances, 1920s fashion and even a ukulele festival. This night market, held on Friday 15 February, is hosted by our own culinary celebrity Kylie Kwong and is inspired by Nick Cave’s art exhibition Until. With a strong sense of cultural identity in his work, these night markets will follow suit, with a range of authentic cuisine from a plethora of shop owners. The chefs from Summer Hill’s refugee-run restaurant Four Brave Women will be offering their stories and food as a part of this theme. Twilight at Taronga’s summer concert series is back with another standout line-up. With headliners like the Waifs, the Whitlams, Vera Blue and a comedy gala featuring the Umbilical Brothers, this event is promising a lot and delivering all throughout February. On-site food trucks and bars complement the performances, and the reduced entry price to the zoo on the day isn’t half-bad either. All proceeds go to ongoing environmental conservation work. A festival encapsulating the essence of beach culture, the Byron Bay Surf Festival is all about the waves, the board and the sand. With 10 events spanning five days including surfing, shaping, art, music, film and yoga, there is something for everyone (even those of us who can’t stand up on a board). Recently opened in Sydney’s historic suburb of the Rocks, Maybe Sammy is the cocktail bar we have all been waiting for. Little brother to Maybe Frank, this establishment is influenced by 1950s Hollywood and Vegas glam, evident in the pink velvet booths and tropical wallpaper, with beige leather bar stools and a backlit wall of all the best spirits. With a strong focus on exquisite cocktails and fine coffee (and potentially the best coffee cocktails in Sydney), Maybe Sammy should be top of your list of new hang-out spots this Feb.
New addition to the Surry Hills food scene is the 4 Pines, a restaurant that fuses the best friends of the culinary world – the beer and the burger. The beer and burger bar boasts unbeatable beverages (including cocktails) and with the Crown Royal on the menu (a double angus patty, tasty cheese, smoked bacon and pickles) you will know where to find us on the weekend! This market is where your small-town local meets the future. Where your traditional art/craft and food stalls are accompanied by a stall that scans your body and inserts you in a virtual world, or where you can play a trumpet made out of ice. 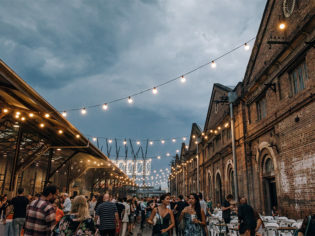 With stalls serving delicious food (and squid ink cocktails) and a local DJ setting the tone, this is a must visit if you’re in Melbourne on the 1st of Feb (a second market takes place on 1 February). Having had such incredible success with Italian restaurant Bar Carolina, Joe Mammone is expanding. His new venture, Cantina Carolina, is a traditional Italian espresso bar and cafe situated on the ground floor of his newest venue, with a wine and cocktail bar, Tetto, on the floor above. If you plan your visit right, you can be enjoying a coffee at 11am and drinking cocktails at 12pm (hopefully until the evening). Pop your head in if you’re in town, because they’re opening their doors this Feb. The AGL Peninsula Film Festival is one of Victoria’s most iconic film festivals. Featuring independent Aussie films, the festival includes both paid and free events, including a free short film festival held at Rosebud Village Green. For a great time, pack a rug, a picnic and some pals and seat yourself in front of the giant outdoor screen for this night of shorts. This February, head to the Docklands for an unexpected culinary experience. With a focus on local ingredients and fresh products, expect meals like the beetroot pappardelle, with its homemade beetroot pasta, fresh asparagus, broad beans, taleggio and walnuts. Also offering quality cocktails (try the Rock and Rose) and great service, in a clean-cut industrial style interior, this is must try this Feb.
Every Wednesday in February, Melbourne. 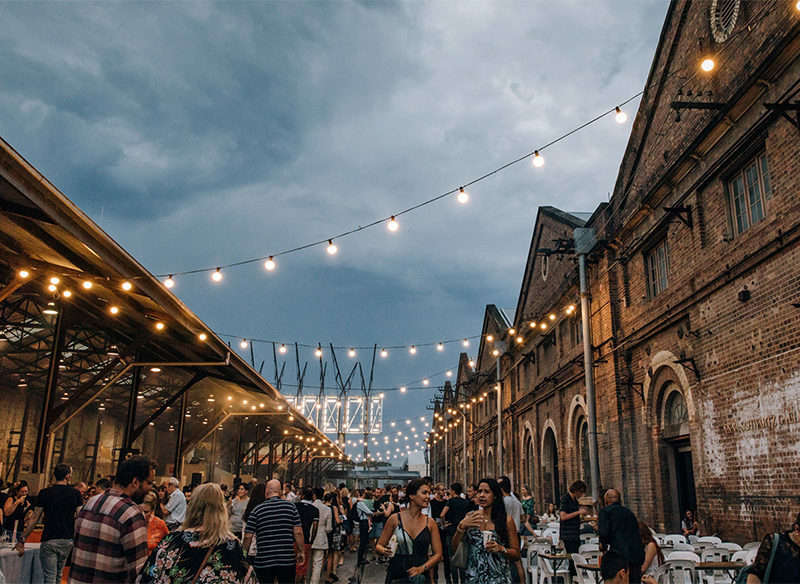 Hosting 60 global street food stalls and festival bars and over 100 fashion, homewares and merchandise stalls, the Queen Vic Market’s Summer Night Market has it all. Polish off some dumplings from Pierogi Pierogi or chomp on some Italian cannoli from That’s Amore Cheese, as you meander through the stalls. On the 20th of February, the cast of Jersey Boys will be doing a special performance of some of the songs from the musical, before they commence their shows at the Regent Theatre on the 23rd. Another special addition to this year’s market is the immersive installation Séance, a thrilling sound art experience that takes place in a shipping container in complete darkness. Available to book online, each 20-minute session is a spine-tingling exercise is sensory deprivation that’s not to be missed. Set in the A Shed near the corner of Peel and Victoria streets at Queen Victoria Market, this market is a book lover’s dream. Sift through the canonical tomes, the romantic novellas and Stephen King thrillers in a warehouse full of pre-loved books. A blues festival in the idyllic country town of Bruthen, East Gippsland, this three-day event includes music, workshops, local food and a country market. Expect great tunes and food on Friday 15 and Saturday 16 February, and enjoy a wind-down recovery day on the Sunday, soaking in some of Bruthen’s glorious small-town charm. Celebrating the end of summer in style, the Yarra Valley Chocolatier and Ice Creamery hosts a 12-day festival of all things ice-cream. With 144 flavours to choose from, and 12 new flavours added for every day of the festival, there will be a combination of all-time classics and exotic newbies to try from. Why not try your ice-cream on a pizza? Or in a hot chocolate? Anything goes at the Yarra Valley’s Irresistible Ice Cream Festival. Held over two days at Rayner’s Orchard, this market showcases the amazing produce of the Yarra. Fresh fruit and veg and flowers, adorn the many stalls, but there are other activities too! Immerse yourself in farm culture with a tractor ride, learn how to preserve jams like your grandma and seat yourself in the cafe to enjoy a delicious (and locally sourced) feed. February 22-24, Exhibition Park Canberra. In our usually very quiet and organised capital city pops up the action-filled, sugar-fuelled and boisterous Royal Canberra Show. With carnival rides, fireworks, motocross and a petting zoo, there is something for everyone at this once-a-year event. Enjoy a beer, a burger and some onion rings as you meander through the stalls and activities, but don’t forget to grab a show bag on your way out. Attracting more than 200,000 people in previous years, the National Multicultural Festival is a lively event that celebrates Australia’s linguistic and cultural diversity. Over 300 stalls line the streets, serving food from every corner of the world, as performers sing and dance on one of the six stages across the festival, unifying a diverse collective in their unique Australianness. February 8-10, National Convention Centre Canberra. With food and wine at the centre of Canberra’s ethos, this show exhibits the best of the best. Hit up the convention centre for wine and food sampling, as well as live demonstrations and plenty of food to buy and take home. February 12-13, Canberra Theatre Centre. With critical acclaim and a bunch of rave reviews, Ahn Do must not be missed live. Following on from the success of his book (of the same title), the live show evokes all sorts of emotions. He will have you sitting on the edge of your seat, crying and smiling all in the space of three minutes. With Ahn Do also being a comedian, the show more than promises quite a few giggles. With performances over two weekends in February, this event is the best way to explore the Australian National Botanic Gardens with a range of live music scheduled on the grounds. Shows take place on the Eucalypt Lawn, and you can expect a wide range: 10-piece ensemble Bewitched playing jazz numbers of the ’40s and ’50s and accompanied by swing dancing group Jumptown Swing, party band Big Boss Groove encompassing hip hop, soul, Motown and modern, as well as a performance by the Band of the Royal Military College. February 2-3, Tynwald Park, New Norfolk. For ages 13+, this is a kids’ event tailored to adults: imagine a giant water-based obstacle course, spread across grassland. This is something dreams are made of. Head over to Tynwald Park to slip, slide and bounce with your pals, but don’t forget to book! Spots fill up fast (understandably). February 1-3, City Park, Launceston. Renowned for its food and wine, Tasmania is a hotspot for anyone who considers themselves a fan of fine dining. A highlight of this food culture is the Festivale, held on the first weekend of February, where 75 food stalls line historic City Park in a celebration of Tasmanian cuisine. With fairy lights hanging from the trees, and Kate Ceberano playing live in the background (on select days), the ambience is perfect for al fresco dining in the park. Held in picturesque Currie Harbour, this blues/jazz/folk/rock/indie festival is perfect for adventure-seekers and those with eclectic musical tastes. On this year’s bill are acts like the Brian Ritchie Trio – the Violent Femmes bassist fresh from curating Tassie’s Mona Foma, Melbourne rockers the Getaway Plan and alt-country act Andrew Swift. But festivalgoers don’t only come here for the music alone; the festival’s variety of activities draws a large crowd. Think pie-eating competitions, surfing, swimming, great seafood (and food in general), a raft race and plastic waterslides to slip your day away. February 8-11, Sullivan’s Cove Hobart. Seemingly a very niche festival, this is a great way to see, eat and explore the coastal nature of Tassie. With a large display of wooden boats (naturally), nautical demonstrations, live music and theatre as well as food outlets with a strong seafood theme, this is a lot more than a boat show. For hotel buffs, February brings one of the most anticipated openings of the year. The DoubleTree by Hilton Perth Northbridge marks the DoubleTree brand’s first Western Australia property, and the first new-build DoubleTree property to open in Australia. Located at 100 James Street, DoubleTree is like many Hilton properties, being a stone’s throw from the heart of the city action. In this case, the full-service hotel sits within the bustling precinct of Northbridge, complete with ample nightlige, shopping and cultural attractions on your doorstep. For those keen not to venture too far, the on-property restaurant James St Bar + Kitchen offers a relaxed and modern dining experience, emphasising the Western Australian produce known and loved in the area. The venue is open all day, featuring local and seasonal ingredients that can cater to your breakfast, lunch, dinner, snack and room-service needs. February 8 – March 3, Perth. The Perth Festival program is jam-packed, boasting outdoor cinemas, art exhibitions and live shows. Highlights include the Melbourne Ska Orchestra, Swan Lake, Lang Toi circus performances and a book club at writer’s week. February 16, Signal Park – Busselton. Somewhere between Perth and Margaret River is a small town called Busselton, whose largest claim to fame is hosting a brilliant craft beer festival. Boasting more than 120 craft beers from 20 local brewers, there is a beer for everyone (over 18). The best part of this festival is that they have combined beer and gourmet cheeses, steaks and pizza to make sure the best brews don’t go straight to you head. Opening their doors this Feb, Mummucc, the little sister of the famous Monsterella Italian restaurant, promises fine wine and cold cut meats, fresh bread and pasta specials. Meaning ‘Mother’ in Abruzzese, it’s aptly named, with the owner Tania Nicolo working with her mother to bring these fine Italian delicacies to Perth. One of Western Australia’s most iconic events is the Rottnest Channel Swim, a 19.7-kilometre open-water event spanning from Cottesloe Beach to Rottnest Island. You can enter this team event, and enjoy the exquisite ocean water off the coast of Australia. If you’re not a swimmer it is equally acceptable to join the mass of onlookers, as you enjoy a coffee on the beach. February 15- March 17, Adelaide. The largest arts festival in Australia, and second largest in the world, is the Adelaide Fringe Festival. Every skerrick of Adelaide is immersed in the arts for a magical 31 nights, where you will find comedians in pubs, slam poets on makeshift stages in alleyways and book signings in cafes. Artists from all over Australia, and the world, head to Adelaide in February to be a part of the Fringe, so really, you should head there too. This historical ritual signifies the official start to the Barossa grape harvest. Beginning with the blessing of the grapes, continued with a procession of robed Barons of Barossa followed by a marching band and finalised with the sharing of the grape juice, this is a tradition not to be missed. Adrenaline and entertainment ignite in a fantastic fusion for this motorsport event. Seat yourself in the grandstand as you are deafened by the sound of rumbling engines and screaming fans. To top it all, three nights of concerts close proceedings – with performances from our very own Vance Joy and Amy Shark on the Friday night, and the Red Hot Chili Peppers on the Sunday. Brace yourselves: Grammy award-winning rap legend Nelly is heading to Darwin for a concert. Get down to the Discovery Darwin to hear songs that have frequented our radios for the last two decades, including Hot in Herre, Ride Wit Me and Just a Dream to name a few. Goyder’s day commemorates the day, in 1869, that Surveyor-General George Woodroffe Goyder arrived in Darwin – and effectively marked the beginning of the City of Darwin. For this occasion Darwin whips out a physical re-enactment of the event, a wind ensemble and hands-on activities on the Darwin waterfront. February 2, Kakadu National Park. World Wetlands Day is celebrated every year to raise awareness around the importance of wetlands for both humans and the planet. With 7000 square kilometres of wetlands in Kakadu, the Bowali Visitor Centre hosts an event to help you learn all about them. With kids’ activities, a barbecue lunch and a wetlands competition, this is a great day out for the whole family. In tribute to their melon farming heritage, Chinchillians have created potentially Australia’s best festival – the Melon Festival. You can expect to eat a few melons, ski on a few melons and participate in a melon bungee, among many other things. Boasting a glorious melon street parade, and only being held once every two years, this is an event you need to jump on. Ocean6 is an event of speed, agility and endurance – on the beach. Watch surf life savers go head to head in this annual event of sportsmanship, across a range of events: paddle board, ski, beach sprint and of course swimming. The event is free, and offers amazing views of those who have both the capacity and determination to do sports on weekends. Recently opened, this upmarket bar is Newstead’s new hotspot for an evening beverage. With world class cocktails, pastel pink tiling, striking gold accents and a glorious menu, this is the perfect place to set yourself up for an evening on the town. The menu boasts an exotic variety: pan-seared cuttlefish and pomegranate salad, sesame crusted tuna sliders, lamb cutlets with Hasselback potatoes and roasted bone marrow with sourdough crisps. Each dish can be paired with one of the 40 drops on offer, and voilà! Night sorted! All you need to bring is the company. If you’re an avid swimmer, have a crack at one of (or all) the events at the Noosa Summer Swim. With long and short races, as well as a social lap, there is room for everyone to participate. With a great vibe, on a beautiful beach, this summer swim is not to be missed (and the prizes aren’t too bad either). With free access to some of the greatest sand sculptures, this is an amazing exhibition of fleeting art. International and local artists create and exhibit their work along a stretch of Surfers Paradise beach, including (in the past) a 10-tonne sculpture and a life-sized pirate ship resting on the beach. With this festival come the championships, where visitors can watch as the sculptors begin with a block of sand and create masterpieces that later form the centrepiece for the festival. If you are interested in sand sculpting, why not take on the challenge of a workshop? Or instead meander around the sculptures at night when they are illuminated and interactive.